Here is the Spring List. What is the best day and time to visit Violet Hour to avoid a crowd? Are there non alcoholic selections for those who can't indulge? toria wrote: What is the best day and time to visit Violet Hour to avoid a crowd? I've never had a problem at or shortly after open (6 PM) on Sunday-Thursday. While they're not on the menu, they will make you an excellent mocktail. It helps if you give them an idea of the flavors/profile you're looking for. I went out for a walk today and passed The Violet Hour. As I looked at the building I couldn't help but wonder. Where is the love? Were those the missing letters? Noticed the missing e and v but didn't look long enough to see the rest. Very clever. Went in last night around 9ish. Ended up having to wait about 30 minutes for them to call us. Probably would have been less but requested seats at the bar. Not a big deal anyway, went across the street for some whiskey shots at Big Star while waiting. Happy to report, TVH served up another great night. Spring menu wasn't live yet (will be starting today) but our bartender (sorry I'm bad with names) made us a Blackberry Caipirissima anyway. Tasty, definitely a spring drink. Too bad the weather has not cooperated. 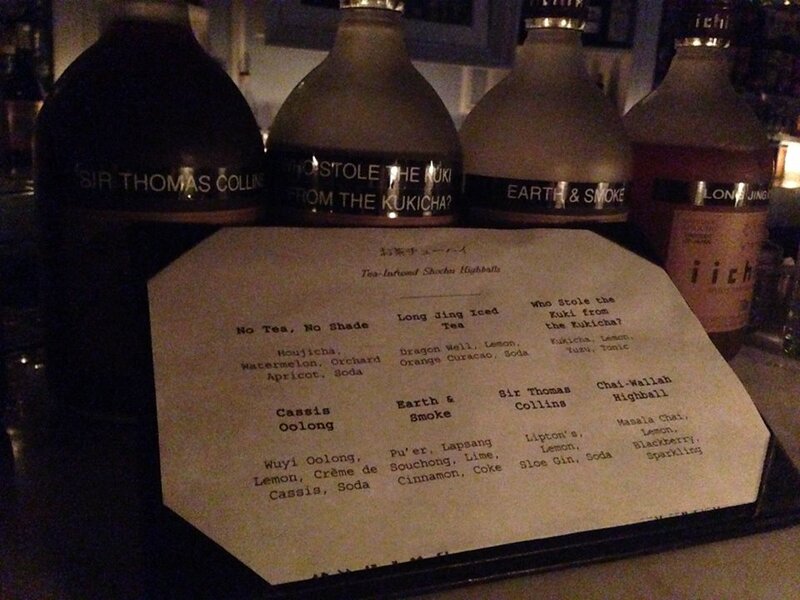 Highlight of the night was a drink he made featuring Ransom Old Tom and shrub syrup. I forget what he called it and what fruit went into the shrub syrup (did I mention the pre-VH whiskey shots?). Very interesting, perfectly balanced, loved it. We had a guest in town, which was the excuse to finally get up and go. I would say it lived up to the hype. Between the three of us, we managed to try 10 different cocktails -- mostly from the Spring menu. All were very good and unique. The decor and atmosphere are ridiculous, but it makes for a fun experience. The service was very good. Our first round of drinks were taking a really, really long time so they brought over a sparkling rosé which was a very nice gesture. A simple "sorry that it is taking so long" would have sufficed, but it is clear they are working for perfect. raytan wrote: Were those the missing letters? Noticed the missing e and v but didn't look long enough to see the rest. Very clever. Yes. Apparently, I know my alphabet better while intoxicated than sober. I didn't notice anything missing during multiple walks/runs/bike rides past, so I thought the new paint job was kind of boring. Finally, it came to me in an instant, leaving TVH at 2am. Cute. The Violet Hour Blog is up and running. We are going to be posting Punch techniques and recipes as they change. Summer is coming and it's time to get ready for BBQs. Dropped in last night for some drinks before Alinea. (!!!) My first time at The Violet Hour. Service was lovely (lovely bearded bloke) and my Dark & Stormy was so well-done that I did not change things up for my 2nd drink. Lots of ginger. Great stuff. My friend had the Go Fast Boat and it was just like our server described...very teenage summer on the beach. Coconut and fruit. My only complaint would be that the music was a bit heavy (i.e. hard rock) for a Sunday night. But otherwise an utterly lovely experience. Can it really be almost a year since the last LTH forum post on The Violet Hour? I was just looking around to see if the new spring menu has been posted anywhere, and found last years, along with finding out the Party on Damen blog is apparently no longer existent. I'm not particularly surprised about the blog, it never seemed to pick up a huge audience. It was something I was very excited about, but never had a ton of content, so no reason to check it often. Either way, I've been heading to the Violet Hour often lately, it seems. Last week, my wife and I had an excellent time, although there were some mix-ups. In one case, I ordered a Spanish Margarita and got a Flaming Heart. I asked our waitress because I thought perhaps they had come up with a new very strong version of their Hellfire Bitters, but it was just made incorrectly. No matter, the drink was still tasty (although not exactly what I was after). I also had a Queen's Park Swizzle, which was not up to their normal standards, either (in fact, didn't really like it). The Violet Hour has always been more than the sum of its parts. Even when the drinks aren't amazing, they are still very good, and the service and atmosphere always means I will have a good time there. BTW there is a secret tea cocktail menu, but only if Tyler Fry is working there. I went last night (he usually works Tuesdays) and all of them were amazing. I especially liked the Earth & Smoke. It was like drinking a holiday bonfire. The No Tea, No Shade is a bit summery, but definitely worth trying. Normally I'm not one for cutesy menu names, but "Who Stole the Kuki From the Kukicha" is pretty dope. No one could reasonably dismiss the historical importance or significance of The Violet Hour in Chicago's cocktail hierarchy. It's ground zero; the roots beneath the trunk of the tree. Before it opened in 2007 there was effectively nothing. Now, we have a wealth of riches. The Violet Hour blazed that trail. And now that we enjoy such good fortune -- so many outstanding venues for cocktails and spirits in town -- it might be easy, too easy, IMO, to dismiss TVH's continuing greatness. Unlike at many other local bars, once you're inside, weekends at TVH are no less pleasant (or more crowded) than weeknights. Yes, the line to get in is typically longer on Fridays and Saturdays but once you're seated, none of that matters. The size of the crowd is controlled and the room is pleasant and mellow. We arrived on a Saturday at about 5:45 and queued up. There were about a half-dozen people in front of us. Shortly after the doors opened at 6, our group of 4 was seated at the bar. From there, the ever-hospitable and highly skilled staff -- Andrew, Patrick and Matt -- took great care of us. And I'm always amazed at what this crew can pull off. The current menu, relatively large even by TVH standards, offers a whopping 36 cocktails, almost all of which are house originals. Just managing all the ingredients would be difficult enough but the fact that guys like Andrew and Patrick can make these drinks on command, without ever consulting a recipe or cheat sheet is really impressive. Matt, the barback working our station, told me that he keeps a copy of the current menu taped to the wall in his apartment . . . just so he can always be looking at it and absorbing it. In my limited bar-going experience, that kind of dedication is quite rare and it speaks volumes about the pride of place the employees at TVH feel. Our group must have tried at least a dozen of the drinks and they were dynamic, bold and flavorful across the board. As always, the current menu is divided up by main spirit and we tried libations from pretty much all of them -- gin, rum, whiskey, tequila, brandy, potable bitters (we skipped vodka). And while it has been mentioned here and elsewhere, it's worth mentioning again that TVH also has an extremely well-curated and reasonably priced Spirits List that would probably be the main highlight at just about any other local bar. We had a few items from this list, as well. Snacks were also had and they were quite nice. I didn't try the Pulled Pork sliders but the Roasted Nuts and Deviled Eggs were both excellent. Other items looked good and are defintely on my 'next time' list. Our 2.5+ hour session flew by and we were sad to leave. For the 2 in our group who'd never been there before, it was a kick-the-door-down, eye-opening experience. And for the 2 of us who have been before, it was a reminder that we are just not frequent enough visitors. The fact that it's not a neighborhood I find myself in very often and that parking can be difficult (at times) will not deter me from visiting more often. As its 10th anniversary approaches, The Violet Hour remains at the very top of the Chicago bar scene. Just wanted to give everyone a heads up that tomorrow night Cure (New Orleans) will be doing a takeover at Violet Hour and that as part of the event, LTH-friend chef Alfredo Nogueira will be cooking up some food, including some old favorites from Analogue . . . Biscuits, Chicken sandwiches, Dirty Rice and a few other small items. It officially starts at 10pm but friends are encouraged to get in early.